If the report this band belongs to is of the ODBC or SQLite type, this property may contain the SQL query that will be launched against the database. When printing the report, Oxetta launches this query during the very first attempt to print the band, and if the recordset the query returns does have records, skips to the first record of the recordset and prints the band. If this band acts as a group header for other bands, Oxetta proceeds to those bands and, after they will be printed, returns to this band, skips to the next recordset record, again prints the band and again proceeds to the other bands this bands represents group header for. If the recordset does not have any records left, the band is not printed anymore. For other report types, this property is ignored. If the Database Query has SQL parameters in it (e.g. 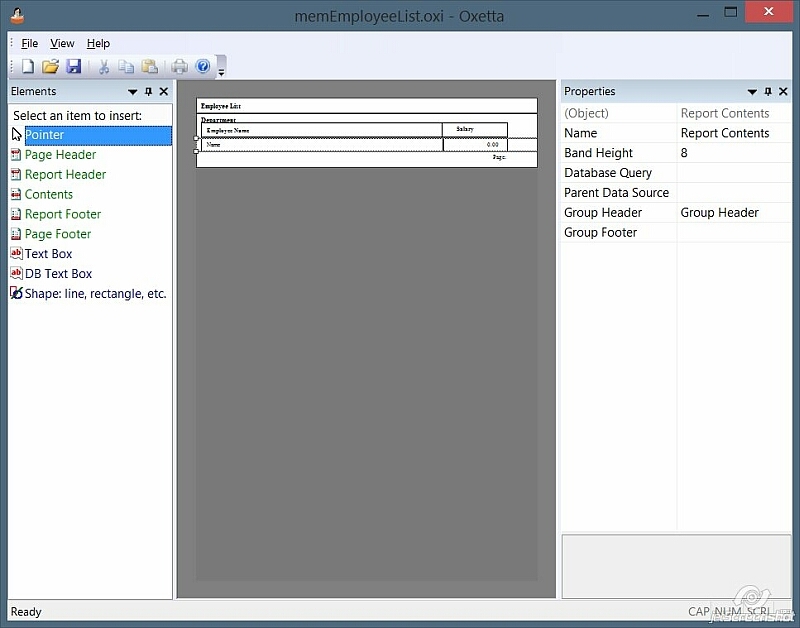 SELECT name FROM employee WHERE department_id=:dep_id), the Parent Data Source property points to the report band whose SQL query and related recordset will be used as the source for the parameter values. In other cases this property value is ignored by Oxetta. If using named SQL parameters (e.g. ":dep_id"), Oxetta gets parameter value from column of the Parent Data Source recordset having the same name as the name of parameter. If using unnamed SQL parameters (e.g. "? "), Oxetta gets parameter value from the 1rst column of the Parent Data Source recordset for the 1rst parameter, 2nd column for the 2nd parameter, etc.